We have implemented more than 500 conveyor systems, helping our customers fulfill their orders with accuracy and on-time delivery. Whether you are conveying individual products, full cases, or pallets, we can recommend the appropriate equipment, technology, and material flow layout. Our engineering team designs conveyor systems using 3D modeling tools, allowing you to visualize and simulate how your final system will operate. Pneumatic conveyor is a unique and useful pneumatic conveying equipment that is needed for conveying fine powders vertically at heights that vary from low levels to as high as 100M. Some of its special features include: no moving parts, no maintenance, and low power consumption. It is highly demanded in the international market for these features and can be customized as per the specifications laid by our clients. Screw Conveyor designs and manufactures equipment for various industries such as Food, Pharmaceuticals, Chemical industries, Packaging industries, salt, cement, coal, bio-mass, agriculture, gypsum and other industries where there is a need for industrial duty equipment to convey free flowing bulk materials. 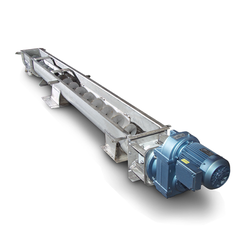 Yagnam Pulverizer Screw Conveyors are available in many configurations. Screw Conveyors are designed based on industry standards and are modular in construction providing flexibility for a variety of applications. Screw Conveyor has a constant volumetric capacity according to speed. It may be exposed to a head of material and by having a correctly designed flight and with variation in the speed can be used to control and feed equipment at a uniform metered rate down the process stream, eliminating surges in the process. In many situations it is the only device that can be used as a feeder. Screw conveyors can be designed without a center pipe. 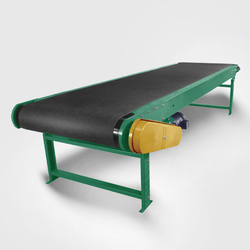 This type of conveyor is called a shaftless screw conveyor and is designed for conveying wet, sticky, sluggish products such as industrial sludges and biosolids. Screw conveyors can be used to cool, heat or dry products in transit. Depending on the heat transfer requirements, a screw conveyor can be jacketed, or a hollow-flight design utilized to provide the necessary heat transfer for the application. 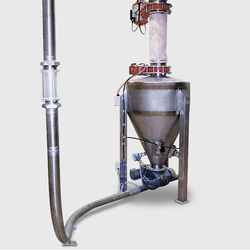 Screw conveyors can be designed to be vapor-tight or hold an internal pressure. This is very important when conveying toxic or hazardous products such as those in the chemical industry. Packaging Details: Packing and local forwarding and delivery charges to the nearest shall be charged extra @ 5% of order value.